Our Collections at the Central Library are, as we saw last week, wide-ranging. While we endeavor to know those Collections in as much detail as possible, we – you may be surprised to hear! – can’t and don’t know about every item we hold. That’s why we occasionally rely on our users to bring unique or interesting items to our attention: one such occasion was during our recent Pop-Up residency at the Leeds Bus Station as part of our Library Fest celebrations. 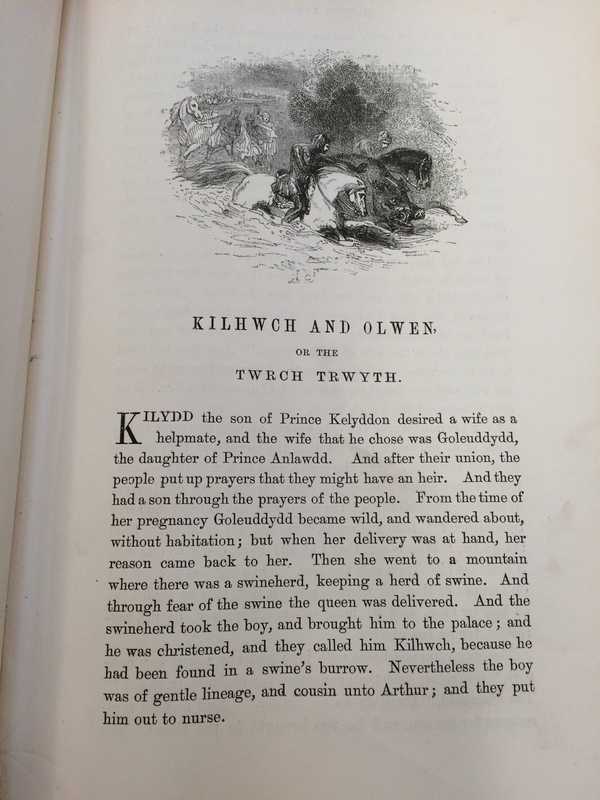 There, a gentleman approached us to talk about a book he had spent many hours looking through in our Information and Research department – the Mabinogion, eleven stories compiled by medieval Welsh authors from oral traditions, which include fragments of tales relating to King Arthur. Commonly said to be the earliest prose literature of Britain, a translation of the full collection was first published in 1838, with six further parts appearing at various points to 1845. A three-volume edition followed in 1846, before the eventual publication of the revised one-volume edition in 1877. That 1877 publication is the one that proved to be the most widely-read and is the edition we hold today. 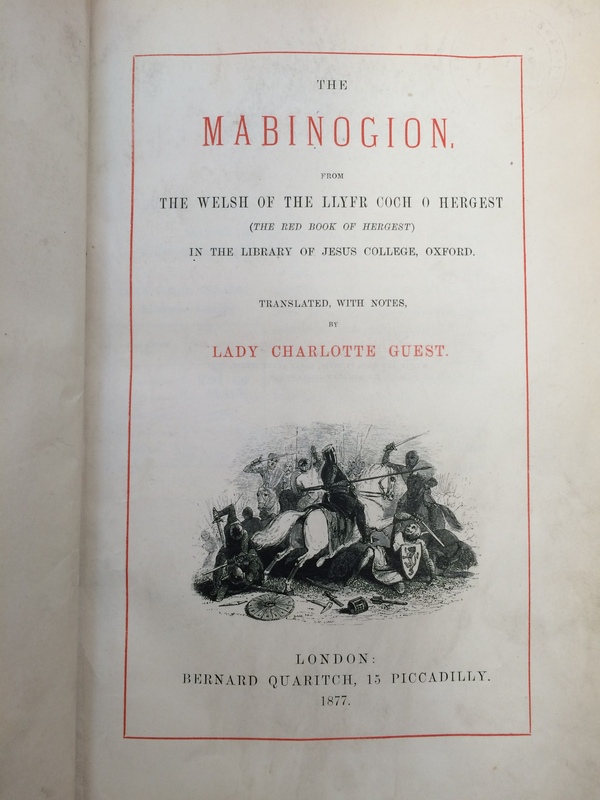 Translated by Lady Charlotte Guest, this edition remained the standard version of the Mabinogion until the 1948 translation by Gwyn Jones and Thomas Jones – a copy of which we also hold here at the Central Library, along with further translations and complementary works of criticism and analysis. Lady Guest was a fascinating figure in her own right: a leading figure in the study of literature and the Welsh Renaissance of the 19th-century, Guest was also known as a leading collector of Victorian porcelain and and international industrialist who pioneered liberal education for the working-classes. You can read even more about Lady Guest through our editions of her journals and a comprehensive biography. All the books mentioned here are available from our Information and Research department; contact them if you wish to view or loan any titles. And if you know of any books held in our collections that we should bring to a wider audience, please get in touch!